Unlock your creative side this summer with the Children’s Theatre Workshop! Day camps, musical theatre camps, and workshops available for ages 4-18! 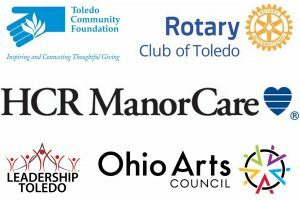 Check back later for some additional summer program listings we’ve got developing! For our youngest theatre kids! Campers will channel their inner critter and create wild (and tame!) animal characters using body, voice, costume, and crafts! Campers will combine a love for all things green and growing with performance! 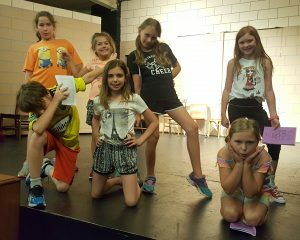 Opposites will spark campers’ acting and theatre experiences this week! Up and down, left and right, in and out…opposites rule! We’re walking a mile in another person’s shoes…literally! Costumes rule this week, creating characters and stories using CTW’s costume stock as inspiration. Campers will try out acting and performance in a circus atmosphere! Campers will explore their talents and tricks and create the Greatest Show On Earth! Take a trip to Oz with songs from our favorite Wizard of Oz musicals and explore this fantastic land over the rainbow! Beat the heat with visions of sugarplums and candy canes in our winter wonderland camp! Things get silly when we combine elves, reindeer, and a certain fella living at the North Pole! Grab your sword and shield because we’re going on an adventure! Campers will create daring escapades with props of their own making and see just how far their imaginations can take them! Fairfield’s a place where nothing ever happens, at least not since Billy Myers got that nasty papercut a decade ago. And with the exception of a pair of vain newscasters, a few fringe skywatchers, and a kooky grandfather living in a galactically fantastic past, most townsfolk are okay with their humdrum ways. Like it or not, though, the winds of change are about to descend on Fairfield faster than a delivery from the town’s famous Flying Saucer Pizza. A couple of love-struck teens report an alien sighting, and Fairfield finds itself in a frenzy. Luckily, the members of SAWPE (that’s the Society of Alien Watchers to Protect Earth) are selling tinfoil hats to help protect everyone. Even the president comes to this sleepy burg, but not everyone in town agrees with his plan to attack the space-traveling Zordonians. It’ll be up to a brave little girl and her unwavering grandpa to stop a war of the worlds in this ridiculously silly comedy that’s out of this world! At the science fair, the exhibits are goofy: vegetarian piranha fish, Hamburger Helper face cream and wrinkle-free bacon. Unfortunately, Pamela’s green potato project was rejected and she vows revenge. Meanwhile, on the remote island of Malibula, something awful has happened at the ’Unusual Bug Research Center.’ The once friendly grasshoppers have turned nasty. What has this to do with the science fair? The face cream has the grasshoppers as a prime ingredient. Anyone who slaps on the goop becomes… no, it’s too horrible to report! The trapped students pin their hopes for rescue on Captain Cracknuckle and his SWAT team. Here’s a hilarious tongue-in-cheek retelling of classic Grimm fairy tales that feels fresh and contemporary! A working mother notices her daughter has picked up some not-so-great lessons from the fairy tales she’s been reading, so she sits her down and tells her new, more modern and empowering versions of some of the classics. In Mom’s new and improved variations, Little Red is an animal rights activist and vegetarian who saves the wolf from the Woodsman; Snow White unionizes the dwarves and overthrows her beauty pageant loving stepmother along with her assistant, Mir’ah; and Cinderella shares her love of angst-filled poetry with Charming and they run off together to live the lives of Bohemian artists. When Red Riding Hood trips over a root in the forest, she spills her basket of goodies only to encounter Hansel and Gretel wanting her food basket. They have finished off the gingerbread house and are now running from the witch. Poor Red is confused — there’s no witch in her story! But when Bambi scampers in, chased by Robin Hood, who is running from Goldilocks because he shot arrows at her three bears, Red knows the fairy tale forest is in total chaos! From Snow White to the heartless Tin Man and the Headless Horseman to Rapunzel to the White Rabbit, the story just gets crazier and crazier! To complicate matters, a Shrek-like Sheriff Ogre tries to shoo away the “legend” characters because they don’t belong in Fairy Tale Forest. The hysterical stage action builds to a crescendo until all suddenly goes black. When the lights come up, we realize it was all just a dream… or was it? In this madcap mash-up of Robin Hood and Little Red Riding Hood, Grandma may lose her cottage to a developer who wants to cut down Sherwood Forest—but not if her granddaughter, Robin Hood, has anything to say about it. With the help of Robin and her Merry Maidens—and a decidedly friendly Wolf—can Grandma find a way to save the forest and her cottage, and keep her money out of the hands of the Sheriff, Prince John and a conniving Bishop? Farcical plot reversals, slapstick chases, clever disguises, and a money bag that changes hands every other minute make this fast-moving comedy as much fun to perform as it is to watch. If you’re looking for a quick comedy that’s easy to produce and full of zany characters, hilarious stage action, and a surprise ending, this one’s for you! Bad news — in the form of severe thunderstorms and an escaped convict — threatens the guests at the Come On Inn of Nova Scotia. By the end of the day, gung-ho aerobics instructor Billie Body is mysteriously murdered during a power outage. Was it the cook’s lemonade that poisoned her, or did someone else have a hand in Body’s death? Who would have the audacity to commit murder under so many noses? Inspector Black, on the scene in search of the escaped convict, has his job cut out for him. As the winds howl, suspicions rage — from Garth the gardener (who weeds with an axe) to an inept doctor on holiday from malpractice suits to a hairdresser who constantly changes her appearance — everyone has a hidden motive to want Billie Body dead. After all, she does have abs “to die for”! 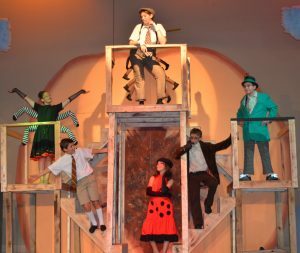 Spend your summer honing your triple threat skills with our summer-long musical theatre program, Seussical! Our staff will prep students to present their audition, cast the show, and rehearse the musical for a weekend of public performances! For ages 10-17. Audition prep and auditions. Cast list released by June 8. 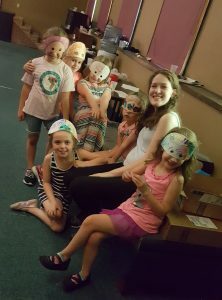 All camps are located in the Children’s Theatre Workshop space in the Collingwood Arts Center, located at 2413 Collingwood Blvd Toledo, OH 43620, unless otherwise specified. The CAC is a large brick building, with double glass doors you will use to enter the building. CTW is the section with the children’s theatre mural. CTW will lock its doors 15 minutes after the program is scheduled to begin and will not unlock doors until shortly before the program is scheduled to conclude. Please contact the office if you need to be let in late, or need to pick up your child early. Every program 9:00-1:00 pm and 9:00-3:00 pm will involve a lunch break. Please pack a lunch for your child and send it to camp. Every program lasting longer than 3 hours will include a snack, provided by CTW. Options tend to be: cracker/goldfish, cookies, fresh fruit, or a gluten/dairy/dye free fruit snack. Families are welcome to send along snacks with their child as well. Camp Directors are being added to their camps as they are hired. Each Camp Director holds a degree in theatre or education. Camp Teachers are assistant teachers to the Camp Directors and have a foundation in theatre or education and are continuing their training under the leadership of the Camp Director. All staff supervising children have been fingerprinted. There is always a staffer who is First Aid certified on the premises. We have two payment options–pay in full or split your payment with a payment plan. 50% is due when you register, 50% is due two weeks before your camp begins. We can offer a full refund if you drop out of the camp BEFORE the day we start your registered camp. If you cancel after the camp begins, we will hold your registration fee as credit for a future program. 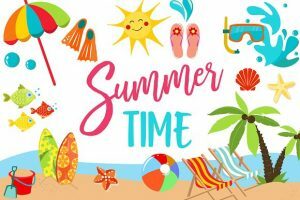 We have an Early Bird Discount in place until March 29th, and a sibling discount which does not expire (use coupon code SUMMERSIBS2019). Scholarships are available! My Child Is Neurodiverse; What Can I Expect? CTW is an inclusive program and we are excited to get to know your child and provide them with the best experience. The more information you give us in advance, the better! If we need to provide your child with their own one-on-one teacher, we are equipped to do so. My Child Has Other Medical Needs Or Accommodations Needed, What Can I Expect? Talk to us and let’s see what we can do! We are invested in making any reasonable accommodations so your child can participate. How Intensive Are These Programs? Summertime at CTW tends to be very relaxed compared to the school year. We try to walk the line between a focused and high-energy program, and not exhausting our campers. The exception to this is our musicals; these are intensive programs that involve high commitment and strong effort to present a polished performance at the conclusion of the program. My Child Is Completely New To Theatre…Thoughts? In our experience, at least 1/4 of each camp includes children who are new to theatre, or very early on in their theatre experiences. We hope your child doesn’t feel intimidated! We are excited to teach! In fact, because summertime is our most “chill” time in terms of intensity, we encourage families to check us out in the summer to see if theatre is a good fit for your child’s extracurricular schedule in the school year. No, parents need to drop off their child and let us run our programs. The only exception to this is the parents for 4-5 year olds may stay for the first hour of camp (we understand the littlest ones can get stressed! ), and parents who have made prior arrangements to stay on site due to their child’s needs related to behavior/medical issues. We ABSOLUTELY invite you to come watch their sharing at the end! What Can I Expect Camp To Be Like? 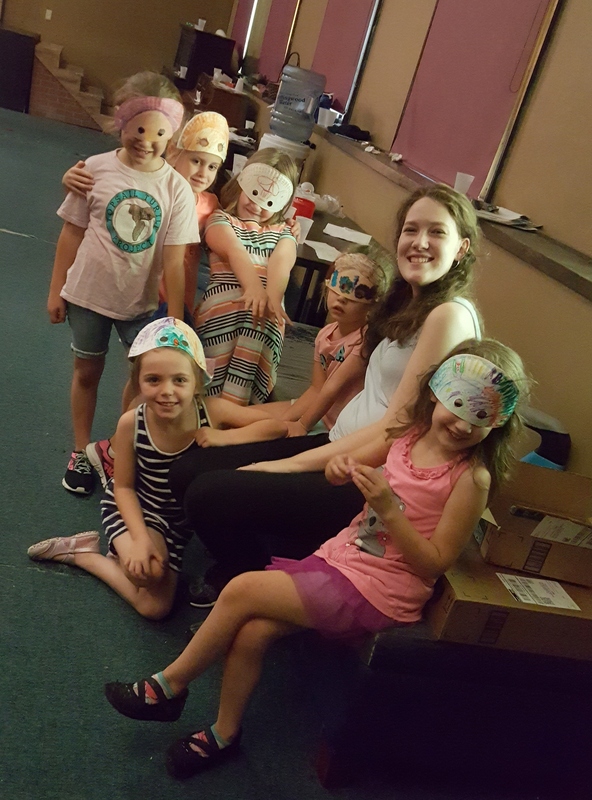 For Ages 4-5: These camps heavily rely upon creative drama, instead of rigid theatrical instruction. Staff will use theatre games to inspire campers to harness their natural tendencies to play into a more theatrical mode. This camp includes guided play, free play, crafts, dance, and a small portion of theatre lessons. There is no reading or script involved in this camp. These camps are designed for campers with no previous performance experience. For Ages 6-8: These camps are mostly theatre games and related activities. The staff will select activities around the theme to inspire some original storytelling, both individually and cooperatively. This camp includes guided play, some free play, crafts, theatre lessons, and rehearsing the sharing. There is no reading or script involved in this camp. These camps are designed for campers with no previous performance experience. For Ages 9-11: These camps are intended to be the happy medium between an informal theatre setting, like the younger ages, and the more intensive theatre training, like the older ages. 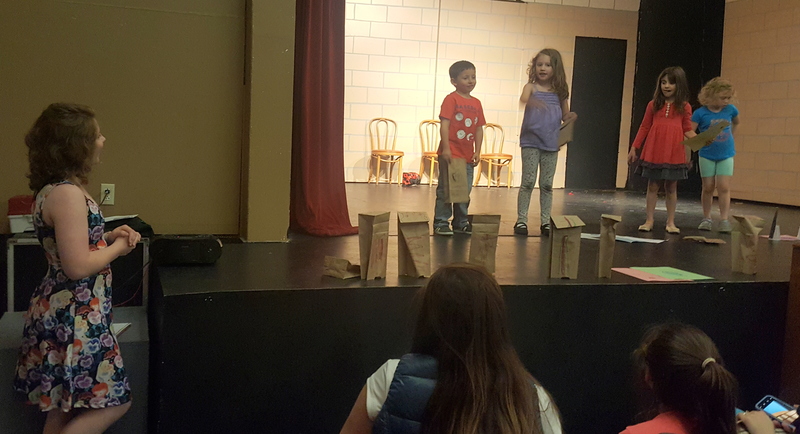 This age group will use a script to spark their theatre activities and lessons, but the sharing at the end will still be informal–no pressure to memorize lines or present polished performances. This camp includes theatre lessons and activities, some guided and free play, some crafts, and rehearsing the play. There is reading involved in this camp. These camps are designed for campers with no experience, or some experience. 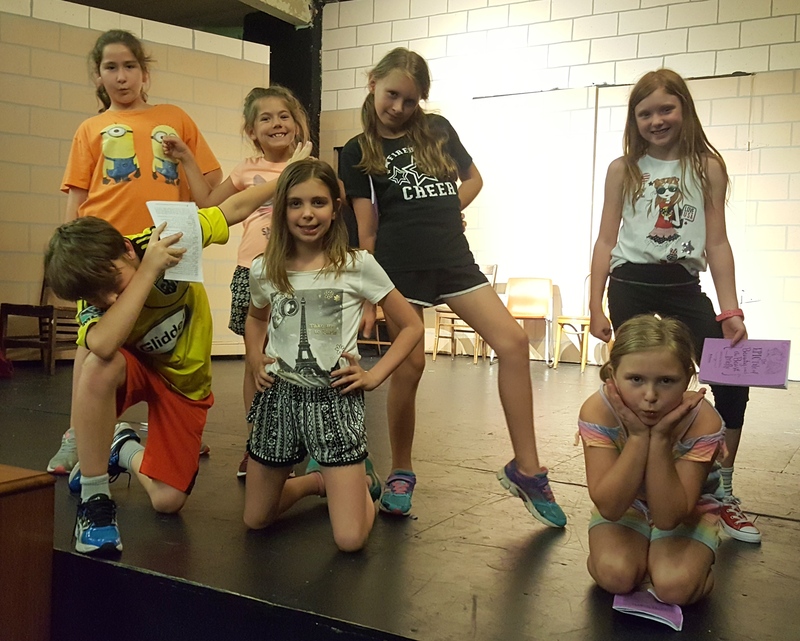 For ages 12-14: These camps have the mindset of “I work at theatre because it’s fun to do so!” Students will receive theatre instruction and practice on a variety of topics, and will have the chance to practice and polish their skills. Like the 9-11 yr old camps, there is a script and a sharing at the end, but it is similarly meant to be low-pressure. This camp includes theatre lessons, activities, and rehearsing the play. There is reading involved in this camp. 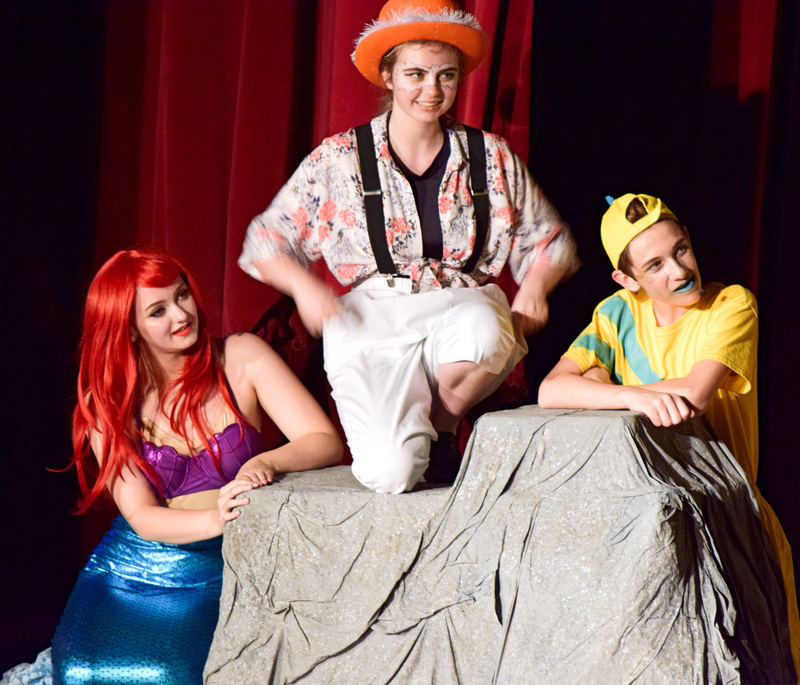 These camps are designed for campers with foundational knowledge of theatre and beyond. Devising: This workshop is for students who want to write plays but get stuck easily. They will collaboratively write a short play, edit it, and present it in a staged reading at the end of the workshop series. They are not going to be writing, themselves; rather, they will brainstorm, improvise, and read the work the Camp Director types up for them. This camp is designed for campers who have no playwrighting experience, or some. A foundational knowledge of theatre performance is helpful. The Mystery of Edwin Drood: This teen musical is an intensive, five days a week, four hours a day rehearsal process meant for performers who are interested in working hard to develop their skills and prepare a show at an accelerated pace. As with all CTW mainstage productions, we take students, teach students, and perform with students. The staff will work with Drood performers to help them develop their auditions before casting; each child will receive a role with stage time. The competition comes in with which role they will receive. This program is designed for students with a foundational knowledge, or more, of musical theatre. Seussical: This summer musical begins with an intensive series of meetings, so the staff can introduce students to the music, story, and dance of Seussical. Auditions and casting are held at the conclusion of the first week. As with all CTW mainstage productions, we take students, teach students, and perform with students; each child will receive a role with stage time. The competition comes in with which role they will receive. This program is designed for students who are new to musical theatre or who have a foundation of musical theatre.